If garden clutter has you down, The Green Pod from Cedarshed is your answer. 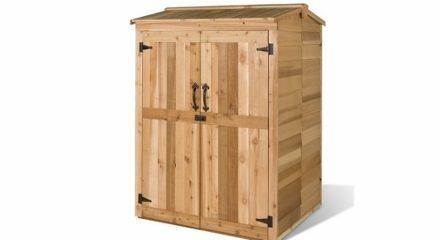 This versatile wooden storage shed was designed to hold recycling containers, but it is a great place to put gardening tools too! Order one to keep your yard neat and tidy, and another for your recycling! This tool shed is 100% Western Red Cedar, and comes with pre-fabricated panels for an easy set up.